Have you been looking for ways to make a little extra money? Well, Qmee might just have the answer for you. Qmee is a browser app that offers cash rewards when you search online. Searching is something we all do every day, right? 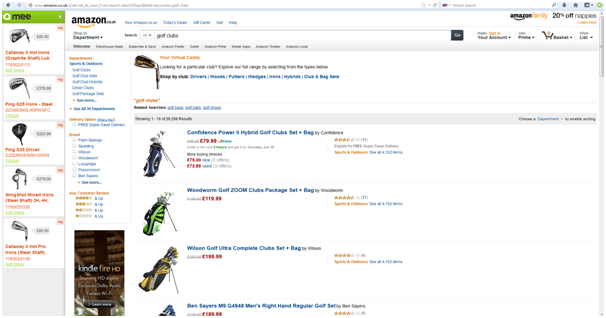 Once installed, which only takes a matter of seconds, Qmee works in the background so that when you’re searching in all your usual places, like Google, Bing and Yahoo and even when you ‘re looking at products on Amazon and eBay, extra Qmee results appear in a side bar. You don’t have to remember to go to a different search bar – it just works where you are, isn’t that great? These Qmee results have rewards attached that YOU can earn, simply by clicking on them if you find them interesting/relevant to you. The rewards aren’t huge – some will be 5 cents, some will be 30 cents and even more, depending on what you are searching for, so it isn’t going to make you rich quickly. What Qmee want to do is reward you for the value you provide to advertisers when you’re searching and shopping online. Business pay to appear in search results online, so Qmee are making sure that you see a bit of that! Qmee results don’t appear all the time, nor do they take up your whole screen – as you can see, they pop up in a bar down the left-hand side of your screen only when Qmee thinks there is something relevant that you may be interested in. The great thing is the results show a picture of the suggestion so you can easily see if it’s what you were looking for. You still have the option to carry on with your Google/Amazon results by ignoring the Qmee results or even closing them entirely with the little X. If you think yep, that’s the one I was looking for simply click on the Qmee result, and the cash reward displayed next to it is instantly earned and added to your piggybank. What’s interesting is that these aren’t points that you accumulate to transfer into a voucher or a gift – these are real cash rewards that you can get your hands on instantly. Once in your piggybank, your rewards can be cashed out immediately, through a PayPal account, or you can choose to donate to charity. There is no minimum cashout amount – so if you have 5 cents in your account and you want to cash it out, you can! So you don’t have to change how you search – you just get rewards for clicking on Qmee results if you want to. And it gives you the opportunity to consider alternative results that you may not have thought of before, which could end up saving you money too. Qmee is invite only at the moment meaning you have to register for a code, but if you go here https://www.qmee.com/invite and use invite code 12F40922 you can get access.